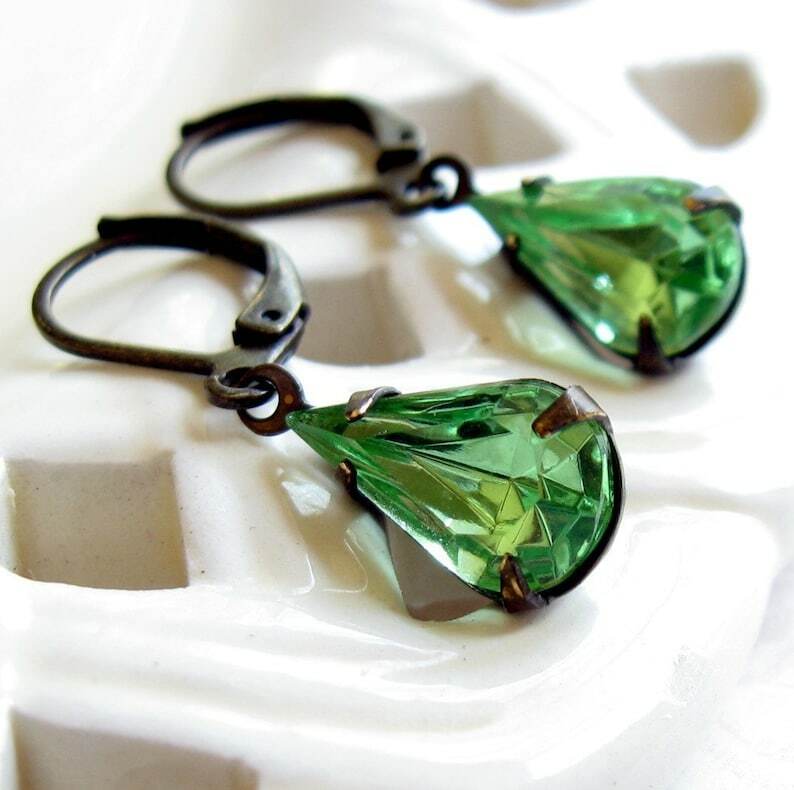 Pretty Peridot teardrop shaped glass jewels are the highlight of these earrings. They were set in a vintage style brass setting. The jewels are 13mm by 8mm, or almost 1/2 an inch long. The entire setting is around 15 by 10 mm. The earrings can be purchased on leverbacks, hooks, or kidney wires. Please see the second picture for other colors that were available at the time of this listing. Sapphire, Emerald, Aquamarine, Pink Rosaline, and a reflective Blue/Green with an AB finish. OTHER COLORS MAY STILL BE AVAILABLE. Please convo me to request special colors! The brass in these earrings is made with a mix of copper and zinc, both naturally occurring elements in the human body. Many people are surprised to find they can wear brass. The most common metal allergy is to nickel. There is no nickel and no lead in the brass I carry in my shop. The earrings are shipped in a ribbon wrapped white gift box shipped inside a secure padded mailer. Your jewelry was made with quality materials and has a 90 day warranty during which free repairs will be made. Returns accepted for 7 days.